Truth Surfer: MN GOP Compromises Everything For Millionaires! MN GOP Compromises Everything For Millionaires! The Minnesota GOP traded away their social agenda items like voter ID, no abortion funding, no stem cell research, union busting, and school vouchers, along their belief in downsizing the state government and their stance against raising 500 million in bonds to successfully protected 7700 millionaires from being taxed their fair share over the well being of the rest of Minnesotans! BTW, of those 7700 millionaires only 3,800 even reside in Minnesota, the rest live out of state. 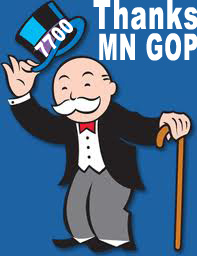 In fact it looks like the only winner in the Minnesota budget deal is the 7700 millionaires! Way to compromise MN GOP! Rather than stand by their right-wing ideology issues, and rather than consider a tiny tax increase on the very wealthy .2% top income earners, and rather than shrink state government... the MN GOP traded it all for the rights to the mantra 'cut taxes for the wealthy'...that's it...move along, nothing more to defend or see here. Our job is done...we protected the wealthy and cut their taxes. - Got kids in school? Expect higher fees, more cuts, and less resources...but if you are one of the 7700 millionaires protected, your tax cuts this session should easily cover these increases. - How about college? Significant increases in tuition (more than 5%) while hundreds of resources, wages, and positions are cut. Once again, the .2% richest Minnesotans protected will be able to easily afford these increases. - On a fixed income? Look for your income to continue to shrink in the face of increase city, county, township fees. Whew...good thing the MN GOP was looking out for those 7700 wealthy people, they shouldn't suffer at all! If you can name it, expect increases in fees and costs as a result of the ,'no-taxes on the rich' MN GOP policy...The 7700 Minnesota millionaires are the only winners in the MN budget...but I'm thinking the MN GOP are now going to need more than them to get re-elect next go around.